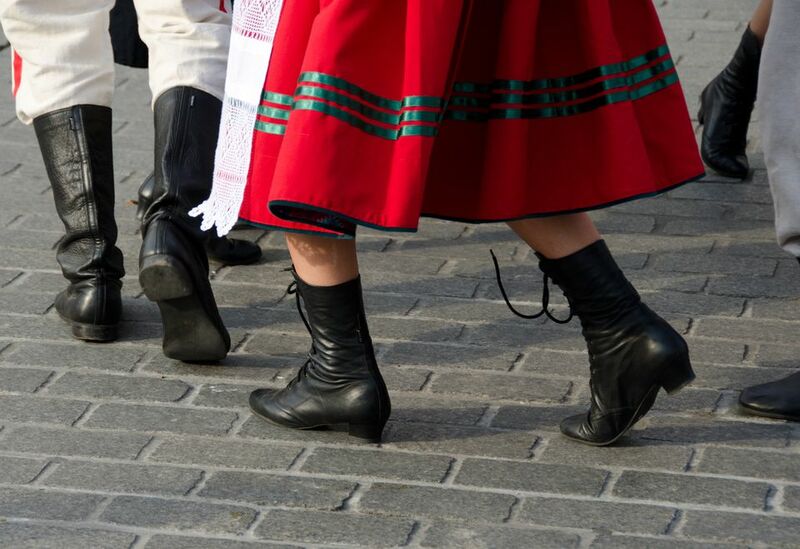 Traditional clothing is a very important part of Poland's cultural heritage, and small differences in an outfit can hold clues about the person wearing it, from their age to their marital status to where in Poland they come from. Read on to learn more. This Polish girl's folk costume is complete with a lace-up embroidered vest, white blouse, and full skirt. This style is seen in many variations of traditional costume, with the embroidery on the vest, details on skirts and aprons and length of skirts providing clues about its origin. The hat of folk costumes is lined with braids and decorated with embroidery. The back of the vest is also embroidered, which is the tradition in folk costumes from the Krakow region of Poland. 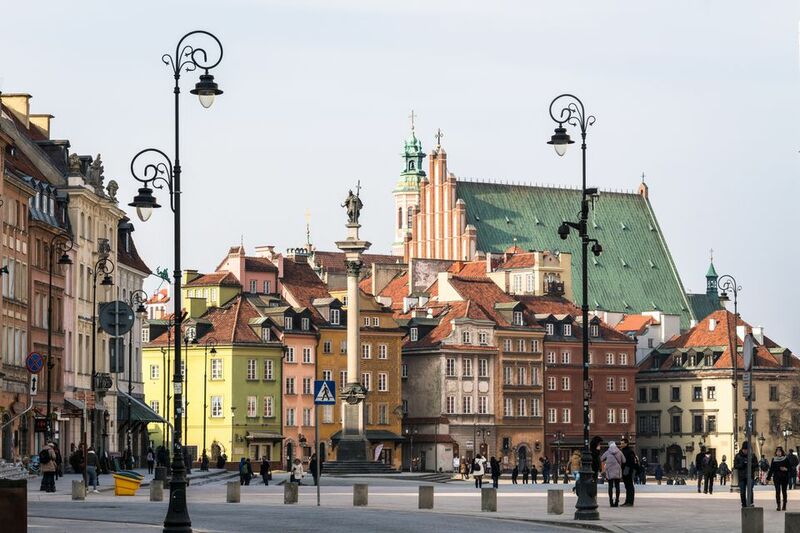 A careful observer may be able to ascertain from the style of head covering not only where in Poland a woman is from, but her marital status. Traditionally, unmarried women wore flower wreaths and ribbons on their heads, while married women wore white kerchiefs. The man's folk costume is decorated with various trims and embroidery. His long coat is paired with high leather boots and a hat topped with flowers. High boots are designed for dancing. In this photo, you see both men's and women's Polish traditional costumes. The women in the front of the group wear red vests and skirts with golden trim and the sleeves of their blouses are tied with red ribbon. White lace aprons complete the outfits. The man in the center of the photo wears a blue vest tied with a sash. These costumes appear to represent different areas of Poland; the white-and-red dresses in the front row look like they could be the costumes of the Pogorzanie, also known as Polish Uplanders. The women in the back appear to be wearing the traditional dress of the Cieszyn Silesia region. The heavily embroidered vests of these female costumes from Poland are tied with ribbons. The women also wear open-work embroidered shirts, flowered skirts, and necklaces of coral beads. The beaded necklace and beaded vests look like the hallmarks of the traditional costumes of the Lachy Sadeckie region of southern Poland. The flowered skirts of these Polish traditional costumes are topped with vests and blouses. The women also wear sashes and beaded necklaces The red sash (known as a pas kontuszowy) and long skirt on the woman in the foreground suggest the traditional dress of Polish nobles known as szlachta. This doll, with traditional braids, wears a white blouse with voluminous sleeves, lace-up boots, a full skirt, and a kerchief on her head. The flowered embroidery on the skirt and the apron pattern suggest this doll represents the Pyrzycki region in the northwest of Poland. What is Wianki in Poland? What Is the Origin of the Days of the Week in Portuguese? Why Do They Break Plates in Greece?